These days it seems like cola is absolutely everywhere, but drinkable water may not be. 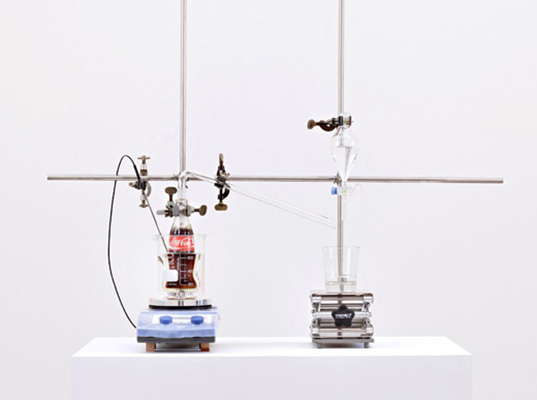 Helmut Smits points out that contradiction with a machine he calls “The Real Thing” that transforms unhealthy bottles of Coke into fresh drinking water. The machine was featured at Dutch Design Week and Dezeen interviewed Smits to get the story behind the idea. Smits developed the machine along with University of Amsterdam masters student Martien Wubdemann. 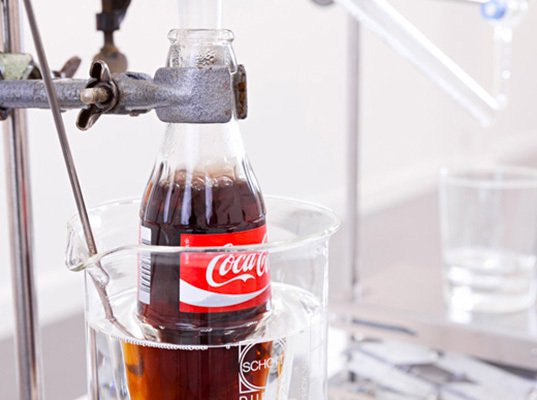 Using a basic distillation process, the machine boils the Coca-Cola to produce water vapor that is collected in a separate glass. And while the contraption isn’t meant to be produced on a larger scale, it does get you thinking about consumption and priorities. “I’m not planning on turning all the Coke in the world back into water, it’s more to let people think about how we humans create the world around us and ask questions,” said Smits. Smits says he came up with the idea because he tries to look at the world through the eyes of a child or an alien to see the things that we take for granted. When he realized that Coca-Cola was really just dirty brown water, it seemed a shame to waste the precious resource, particularly when he discovered that in some areas of the world, people have better access to Coke than clean water. “A machine that filters Coca Cola into pure drinking water suddenly makes a lot of sense in a world in which drinking water can be harder to come by than the multinational soft drink,” Smits said. To quote a friend: "This is a distillation setup. It's not even a machine. It's using basic chemistry practices that were known in the first century (AD)." We do take a lot for granted.I wish I would have thought of something that genius. It\'s not like that at all. There are places in countries where companies like Nestle and Coca Cola buy all resources of fresh water from the government and the people who live around there suffer because they were suddenly not allowed to gather the same water they have been using for years. They have to purchase the water for a much higher premium - in some cases water is more expensive than Coke. This project is more about expressing the issue of fresh water scarcity and getting people to think about the effects our products have on the world. Great concept. Its like buying a five star hotel and then saying that it's too much pamper, it's harmful. Then you take out the hotel piece by piece, collecting just bricks and roof and then throwing away all the other stuff to build a single room and call it SIMPLE LIVING. Nonsense. These days it seems like cola is absolutely everywhere, but drinkable water may not be. Helmut Smits points out that contradiction with a machine he calls "The Real Thing" that transforms unhealthy bottles of Coke into fresh drinking water. The machine was featured at Dutch Design Week and Dezeen interviewed Smits to get the story behind the idea.